Second time at Birds Eye View. Already scheduled for next year! The team was easy to reach and quick to reply to emails. I love being able to work with a local rental agency (vs. AirBnB or VRBO) and feel that Manzanita Beach Getaway provides a better value with friendly, personalized service. Thank you! Perfect beach house in the perfect beach town! Cedar House is bright with lots of natural light, cheerfully decorated, well laid out, and spacious. Nice outdoor space with front and back decks. If you are looking for a quiet, off the beaten path, super cute, bike-able beach town Manzanita is your place. From the renting to the check out, and I even spoke briefly to two young housekeeping team members, everyone was friendly and nice. Thank you for that. From the signs hanging up around the basement asking what you preferred happen, to instructions sent by email about the renting, to check out have been well thought out to reflect a friendliness. None of your written instructions on anything reflect "warning!" When we drove up, I thought the landscaping looked neglected, and I was worried about the inside. However, the inside is so convenient, clean, and stocked with everything known to man that I was very pleasantly surprised. Thank you for your caring vacation rental. The layout of the house was so convenient for us. Adult children and grandchildren slept upstairs, 70-year-old me got the very quiet bedroom downstairs close to the bathroom and food. The basement floor wasn't used by us much, but it did provide a very clean and organized place for children to run up and down stairs and play at the Foosball table some. It is very cool to have bikes available, although no one used them. Garbage containers were very organized and clean, and laundry was close and centralized to check out went smoothly. Great room is a wonderful gathering place, separate bathrooms with bedrooms, easy walk to beach and shops. Well-stocked with towels, dishes, cookware, games, bbq. A great vacation home. Very helpful; I was very late to make reservations for the week I stayed, and then extended length of stay after originally booking property. Although I needed to piece together my accomodations, your team was very helpful with suggestions for available properties. I would happily stay at Johnnys Garden again! The only 2 things that would be a deterrent, is that it was very warm when we checked in. I drew the West facing Window curtains and opened lots of windows for cross breeze. The overhead ceiling fans were great! More of a deterrent was the TV channel selection. Owners have Direct Tv and additional channels besides the basics were infomercials, religious, and childrens ( that make sense). I couldnt find a decent cable news station ie, CNN or MSNBC; at least one premium channel would be appreciated as well. Otherwise the place was very comfortable and lovely!! Thank you! Beautiful home! A little tight around the kitchen table for dinner but a very comfy home. We thoroughly enjoyed our stay on multiple levels. The only thing I could suggest would be to secure a more reliable WiFi internet connection. The current situation is not dependable enough to conduct work for any length of time. I needed to call the team a few times during the week. One was for loss of Wi-Fi and the other was about the dishwasher. Both issues were quickly resolved the same day I called. Very friendly and helpful person I talked to on the phone. Our family all loved staying at Dragonfly! We will definitely be back. It could use more forks, knives, spoons, coffee cups and plates. Overall we had an amazing vacation! Thank you so much! The big deck out back and the very nice bar-b-que. Our family loved sitting outside for dinner every night. Close to town but far enough away that it was super quiet. Very comfortable. Just wished it had more of a view of the beach and ocean. Tell us about your favorite feature of the property: Access to the beach. When I had trouble connecting to the emailed information sent about check out procedures with the door lock, a nice young woman called to learn if we were having trouble. She was quite pleasant and gave us permission to leave. This home was spotlessly clean, although porch does smell musty even with the windows open. And, the home is plenty large even for 6 guests. The layout was great. Beach items were plentiful as were toys and games. 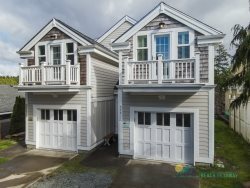 Location is excellent for both beach access and town shopping. Kitchen was very large so multiple people could work at the same time. It exceeded our expectations. Love the house, but the shuttered windows to the living room from the upstairs bedrooms make those rooms not quiet. We really struggled with mornings and folks wanting early bedtimes with the noise carrying into those rooms. You hear every little sound from the open space downstairs. Tell us about your favorite feature of the property. N/A	N/A Great open kitchen, dining, living room flow and wrap around porch! We've been coming to Manzanita for over 20 straight summers in a row, since our kids were born. We love the town, the beach, the golf course, and the people there! See all comments above. Thanks Janet and Danielle!! Hope to rebook for next summer House was super clean!! Loved the dog friendly set up! Cute layout downstairs and nice bedding (though as mentioned, all of the pillows were foam and not comfortable). Loved the master deck and view from there! Carpet was plush and lovely underfoot. Great closet space. Videos were the best; we loved that you had Kiki's Delivery Service and Office Space Garage was nice and clean, too. BBQ was nice! Great street - nice and convenient to the ocean and the golf course!! Always friendly, efficient, accommodating, and responsive. The layout, location, and the amazing back deck! We loved all of the birds in the morning. :) We will absolutely be back!